The biggest drawback of W3Schools is that you can’t access these awesome tutorials without internet. Fortunately I have found a great solution for this problem. So in this article I am sharing the link to download W3Schools offline version for absolutely free. 2. Now click on download button to download the file. 3. The file is about 36 MB in size and will become about 140 MB after extracting. Use any compression tool like Winrar to extract it. 4. Now go to folder www.w3schools.com and then open the default.html file. 5. 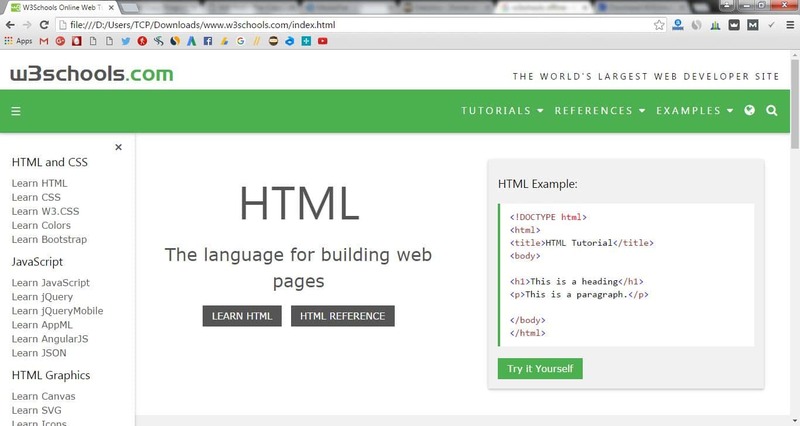 This will open the W3Schools offline version website. Make sure you have any browser installed in your computer. Hi Kristeffer, which browser are you using for this, Chrome or firefox is recommended, It’s 1 year old version, currently I’m uploading 2018 version stay tuned. It’s an remarkable post for all the web people; they will get benefit from it I am sure. That’s great dude, you have downloaded the whole website, is this html5 or html ….